Kriti Kumar comes from an artistic background. She was awarded the best designer of her batch while her graduation as well as outstanding performer in the field of fashion from Graphic Era University. She has worked in various expo houses & studios as an incharge fashion and design. 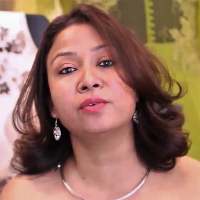 After that she started her own studio with only 2 machines names as Label Kriti Kumar. She has been operating that from 20 years. She is not only designing clothes, she is giving consultancy in clothes and she has the only consultancy for fashion in Dehradun. She has also worked for various bollywood stars and some of the films. She is also an external examiner for the Uttaranchal board of education. Designers use their thoughts, imagination and creativity to form a particular collection with new style and trend, when this particular trend is followed, then it becomes fashion. This industry thrives for the change and designer's job is to make those changes. When the designers are able to convey their thoughts and imagination, it gives immense pleasure to them while they see their clothes being worn by people and their style being followed. "I am from an artistic background and that motivated me to choose this career. I was awarded the best designer of my batch while my graduation as well as outstanding performer in the field of fashion from Graphic Era University. I have worked in various expo houses & studios as an incharge fashion and design. After that I started my own studio with only 2 machines names as Label Kriti Kumar in 1990. I am not only designing clothes, I am also giving consultancy in clothes and I have the only consultancy for fashion in Dehradun.I have also designed for various bollywood stars and a few films."